I wanted a burger. I REALLY wanted a burger. A cheese one. Burgers are a bad idea. You have to get the fries…the coke…the ketchup, mayo, salt, gluten… Potatoes are a better idea. These made a fabulous little lunch. I sauteed onions and garlic in extra virgin olive oil and Himalayan salt. 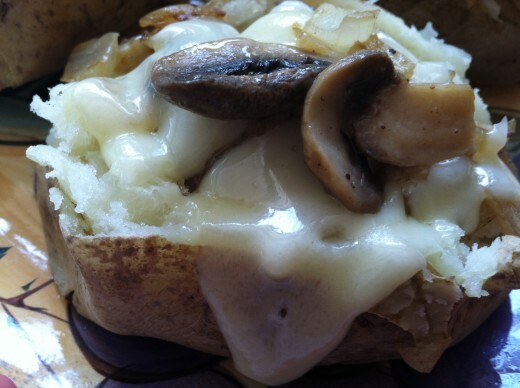 Then I added the mushrooms and cooked them with the onions, the same way I’d make a mushroom and onion Swiss burger. I cheated and microwaved the potatoes. Did I mention it was a very quick lunch? 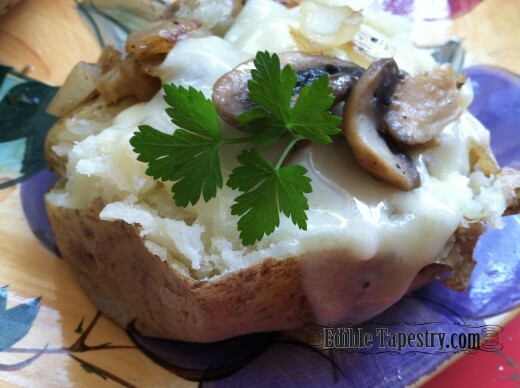 When everything was done, I split the hot potato open and added the flavorful onions and mushrooms. Then I melted a little Swiss over each one to top them off. Yum! Yes, I know this isn’t really a recipe but these were darn good enough to be the subject of a blog post all on their own. I think I’ll do this again sometime…soon.